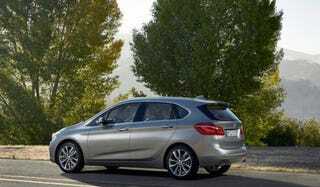 BMW Active Tourer: A Prius Killer? Hybrids are the one segment where Americans will buy a compact hatchback. Plan on selling just a gas powered luxury hatch? Good luck…remember the A3 Sportback? Audi sold a measly 857 A3 hatches in 2013 and only 7205 in 2012. Lexus on the other hand, sold about 15k of their CT200h in 2013. That is twice the amount on a car that is half as stylish (the new CT looks pretty good). Why? Because hybrid. In the same model year, Ford moved 35k C-max hybrids and Toyota, the king of hybrid sales, moved 145k Prius liftbacks and 35k Prius Vs. The entire Prius family of vehicles totaled over 234k in 2013. The interesting thing about all those Prius sales is that a good chunk of them are bought by people who can easily afford a luxury car but want the feel good side effects of buying a hybrid. I don't have specific sales figures to support this but just imagine how many Priuii you can spot in your local wealthy neighborhood. According to Bloomberg the Prius was the best selling car in California, wealthy Californians love their hybrids and they also love their BMWs. This segment is where BMW can capitalize on a very real and very profitable niche market and not those made up niche markets like the Grand Tursimos. Given the 225 AT's numerical designation, I have to believe that US pricing will fall somewhere in the lower 3 series range of 30-35k, with a fully loaded M-sport pushing 40k. The unpopular CT200h starts at around 32k and a fully loaded Prius V is in the same ballpark. A 33k 225AT hybrid would drop a bomb on both of those. BMW could even offer all-wheel-drive because we know how much BMW buyers love their Xdrive. But won't a 225AT hybrid cannibalize the i3? I don't think so, the i3 is a low production specialty electric car. It is also quite small and is still limited by the electric range. Range anxiety is still an issue for many "green" buyers. So why am I encouraging a 225ActiveTourerHybrid Xdrive M-sport when BMW has already lost their way? Two reasons- 1st. Because I believe that a FWD BMW with a hybrid powertrain will actually dilute the "ultimate driving machine" ethos less than a gas purely powered one. 2nd- Because profit equals projects. Remember how everyone lost their minds when Porsche came out with the Cayenne and Panamera? Both of those cars created record profits for the automaker allowing them to keep making low volume sports cars like the 911 GT3. All you Jalops would love to see a modern M1 right? A 225 AT hybrid might just open the doors for that legend to return. So BMW, give that niche a hybrid….niches love hybrids.